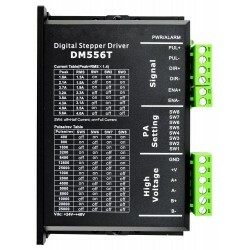 The DM542T is a fully digital stepper driver developed with advanced DSP control algorithm based on the latest motion control technology. It has achieved a unique level of system smoothness, providing optimal torque and nulls mid-range instability. 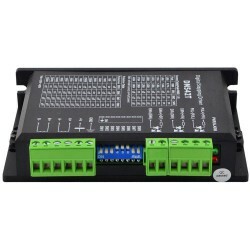 Its motor auto-identification and parameter auto-configuration feature offers quick setup to optimal modes with different motors. 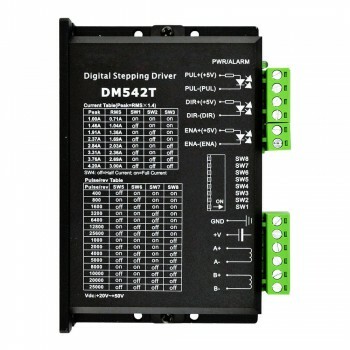 Compared with traditional analog drives, DM542T can drive a stepper motor at much lower noise, lower heating, and smoother movement. 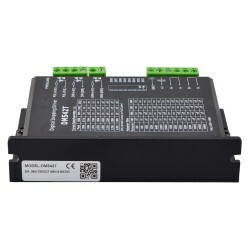 Its unique features make DM542T an ideal choice for high requirement applications. Easy to use. Runs cool. Read the manual, set the switches, wired them up and have not had to do anything else. 60+ running hours on 3 drivers. Take a cutter knife and cut out the wall of the 2-pin Enable terminal at the border of Dir + Pul. 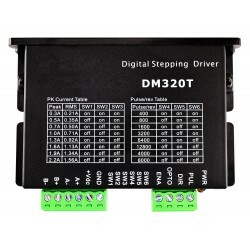 Use the six-screw plug for Ena+Dir+Pul and use the two-screw plug for power and the four-screw plug for the stepper motor. 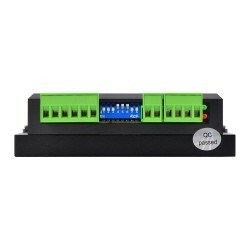 This way the power and motor cable can go out of its case in different holes. Dump the six-screw plug and get one more two-screw plug and one more four-screw plug. 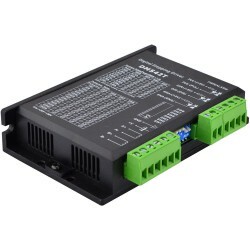 Get a driver what has the correct terminals to connect a six-screw plug for Ena+Dir+Pul, a four-screw plug for the motor and a two-screw plug for power. So every cable with plug can go out of different holes of its enclosing case. 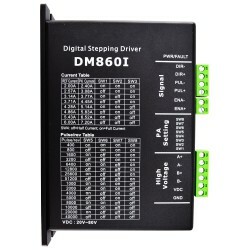 This driver is very the easy to setup and use. The documentation does not mention this, but to run a 200 steps per rev motor at full steps, all switches (5,6,7,8) must be on. However your motor will seems somewhat jerky, and running at 400 or 800 will be much smoother. Using an S-350-48 supply @ 47 volts I was able to drive a NEMA 24 motor up to 1350.4 RPMs. The motor must be accelerated to this speed or a stall will occur. The driver did not show any signs of over heating, or stress. Per documented specs, the pulse on duration was 2.5 micro seconds but it will operate at 0. (though not reliably). I was able to drive my NEMA 24 motor up to 172.4 kHz. 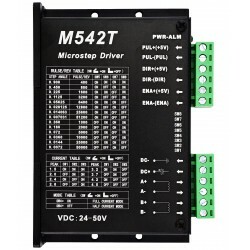 I have no doubt the driver will run at the advertised 200kHz, but the motor must be able to respond to a frequency so high. 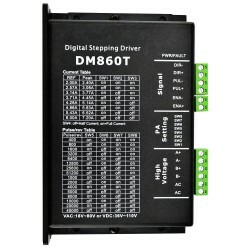 For the money, this is a fantastic driver. Actually, even a more expensive driver probably wont perform much better. Item arrived as-described, and ran my NEMA 23 motor as advertised. Lots of settings, and easy interfacing for hobbyists.